Ground beef tacos are something I hadn't made in a very long time. Usually I make steak, shredded beef or chicken tacos. Call me a snob, but when someone says "ground beef tacos," I get a mental picture of fast food chains and packets of seasoning mix. Not that there's anything wrong with that, but I just don't "do" either. Frugal by nature, I try to plan my menus according to what's in season and what's on sale. I got a great buy on some organic grass-fed ground beef and some organic spices, so I thought it was the perfect time for ground beef tacos. The thing about making your own seasoning mixture instead of buying a packet of taco seasoning mix is that you can put whatever you want into it or, in my case, leave out what you don't want. Most packets have onion powder and garlic powder, both of which I seem to be allergic to; but you could certainly add them if you like. I just remembered! The very first* tacos I ever had were ground beef tacos. I was in the sixth grade, and we were studying Mexico. The class got divided into several groups that were to come up with a different project. Of course, my little group decided to do food. The mother of one of the girls showed us how to make tacos, and we made them for the whole class. *My dad, if you recall from earlier posts, was a steaks and chops and roasts kind of guy who did not like ground beef; so we did not have things like tacos or casseroles, though he would tolerate the occasional shepherd's pie. I have a certain way of cooking my tortillas so that they make a rather crisp, though not completely crisp, taco shell without the deep-frying. What kind of taco shells do you like? Update: Forgot to mention that you need to drain off the fat once the meat is thoroughly browned. Unless there is no fat to drain, as was the case with my very lean organic grassfed beef. 3 Meanwhile, heat the griddle. If you have an 11-inch square griddle, you can cook two tortillas at a time (with just a little overlap). Pour two little blobs of oil (about the size of a quarter or a little larger) on the griddle. Place a tortilla on each blob of oil and push it around till tortilla is coated, then turn it over and coat the other side in the same way. When the tortillas are starting to brown and bubble on the bottom, turn them over to cook other side. Before they get too crisp, fold them in half. Continue cooking until crisp; turn and crisp the other side. Drain on paper towels and set aside until ready to fill. Repeat three times. 4 Have your bowls of cheese, tomato, avocado, lettuce, whatever you want, ready. Divide the taco meat among the 8 taco shells, using about 1/4 cup per taco. Add cheese and other garnishes. Jenn, isn't a properly cooked taco shell the best part of the taco?! (Mine turn out best when I've been making them fairly regularly.) Glad you convinced your mom to lose the seasoning packet (though I did notice a new rack of *organic* seasoning packets at my local health food store). I can't remember the last time I had tacos. These look great! These days I often make fish tacos but these beef tacos sure sound and look good! Yes, I've used the seasoning packet before but these spices to look too complicated. I bet it's much better this way. I do like my corn tortillas cooked in oil but just until they start to bubble. Mmmmm, sure sounds good! Thanks, yummychunklet! Give them a try! Richard, thank you! Fish tacos are wonderful, too, especially when the tortillas are cooked exactly right! I love tacos. I remember as a 10/11 yr old going to eat at Taco Bell for the first time! I haven't eaten at a Taco Bell in decades, but I remember liking what they called a Bell Burger. 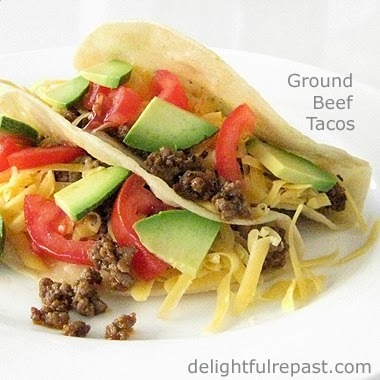 My husband loves ground meat and tortilla...this is a perfect combination for him. The taco looks very delicious, Jean. Thanks, Angie! I don't like yellow corn tortillas at all, but I love the white corn. Taco Jean’s – I like it. You just dropped Taco John’s stock down 600 pesos. And do I have your taco shell texture figured right? Very slightly chewy? I do like that. Always felt that chomping into a very crisp taco was like biting a lightbulb. I’m guessing your sauce is interesting to, though I down everything that doesn’t have TNT or something over the top on the Scovel [SP?] Scale. If the sauce adds enough moisture, I also prefer the ground beef to be well-drained and sourced lean. And did you mention cheese? Mucho cheese! That’s a Sochi gold medal taco! Thanks, Sully! Yes, I think you've figured the taco shell texture exactly right. I added a little update to the directions about draining the fat. With my very lean organic grassfed ground beef, there is nothing to drain, so I neglected to mention that. I grew up with Mexican food- tacos, big pots of beans, enchiladas, spanish rice- so yum. 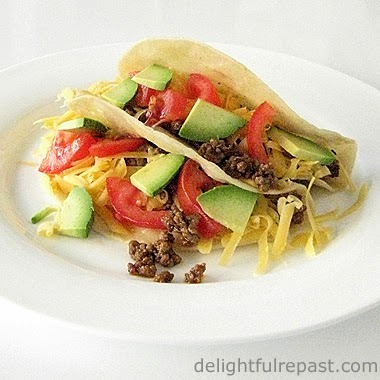 My favorite taco shells are lightly fried- not crispy but not super soft either! I like your spice mix; like you I don't like the pre-mixed seasonings. Another fun food post to read! Melissa, thank you! I didn't have much Mexican food till I was in high school and eating away from home more frequently. Funny thing, long after the kids were grown and gone my dad actually tried, and liked, Mexican food! Amy, thank you so much! I hope they turn out well for you. Greg, I think it's wonderful that a few regional differences still exist in this day of a homogenized America! Jean, as others have stated, childhood memories recall mom's ground beef tacos in pan fried shells. And the packet, yes the packet! I make mine much as you do, and Mrs. W has developed a homemade seasoning mix to rid the pantry of...packets. Great post and thanks for the smiles! Brooks, thanks! Thought of you this morning as I contemplated my next blog post -- a special cake for a special occasion -- stay tuned! Thanks, Annette! I love the shredded chicken wrapped in a flour tortilla, too.